ANY ARTICLES printed over the years in the Sacred Music Journal have more to do with Liturgy and Theology than they do with the subject of music. However, this is not meant to be a criticism. Many of them are quite interesting and worthy of careful reflection. Furthermore, they serve as a “testimony” to the times, providing a window, as it were, for future generations into “what was happening” with the Liturgy in 1930, 1940, 1970, etc. I was recently reading the following article by Andrew Nash. (You can download the entire thing as a PDF below.) Sacred Music usually does a really nice job providing a Bio of each contributor, usually at the end of the issue. However, for some reason, no Bio was provided for Andrew Nash. Perhaps this was an oversight. But even brief comments are comments. They assume a need to comment. 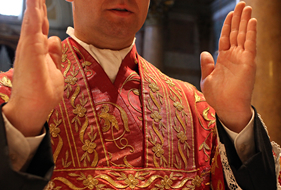 The liturgy has become an activity which is no longer self-explanatory. It is not something which it is natural just to do. It has become an artificial activity—something which doesn’t come naturally. Contrast it, for instance, with the natural rituals of daily life. When we shake hands, we do not feel the need to explain, “By this gesture I am establishing contact with you.” Even more, when we express affection by an embrace or tousling a child’s hair, this needs no explanation. The rituals of family life—singing “Happy birthday to you,” putting up a Christmas tree, cutting a wedding cake—need no explanation and would of course be killed by one. Communal worship, however, has apparently ceased to be something we can do without constant explanatory comment. This is a most extraordinary state of affairs.
. . . None of these [hymns] was liturgical. They were imported into the liturgy but were massively supplemented, indeed soon swamped by, the Protestant hymnody. Many of these are very splendid hymns— but they necessarily brought with them their contexts of Anglican or evangelical worship. Their melodies, rhythms, vocabulary, diction, sometimes even theology and certainly spirituality, were non-native to the Catholic liturgy. (Even those which are translations of ancient hymns from the divine office had never existed in their vernacular form as such.) It is significant that the most progressive liturgists quickly found them unsatisfactory— they were old fashioned and formal. What was wanted was something friendlier and more informal. And so 1960’s “folk” music was imported into the new liturgy.